I understand. It's time to start looking forward to the 2016 Presidential Election. After all, it's been three long months since our last national election and the next is less than 650 days away. I understand. The Democrats are Ready for Hillary. Ready or not (and really nobody is), I understand we are going to get plenty of Bernie and Liz. I understand that over the weekend we saw a parade of Republican hopefuls make an appearance at the Iowa Freedom Summit and learned: Everyone hates Christie; Walker was Best In Show; Romney is on a Mission From God; Rand Paul is Ron Paul's son; Trump is pretending to run and is upset that nobody believes him; Palin is pretending to pretend that she might run but not really; Republicans are pretending they won't nominate Jeb Bush; and I understand we're just getting started. Spoiler Alert: Nobody wants Clinton vs. Bush in 2016. Doesn't matter. It's going to be Clinton vs. Bush in 2016. They are the two best candidates. Clinton's a lock and Bush is the only Republican with a chance to beat her. The Dividist will be supporting Clinton to preserve divided government and avoid the risk of Republican One Party Rule. And I expect she will win. That said, I'm not ready to let go of the 2014 results. We know the numbers. In 2008 the Obama tsunami swept the Democrats into Unified Filibuster-Proof One Party Rule of our federal government. The punditocracy were delivering eulogies for the GOP because of demographic destiny or voting Democratic being genetically wired or... something. Since then the Republicans have rebounded with a vengeance. 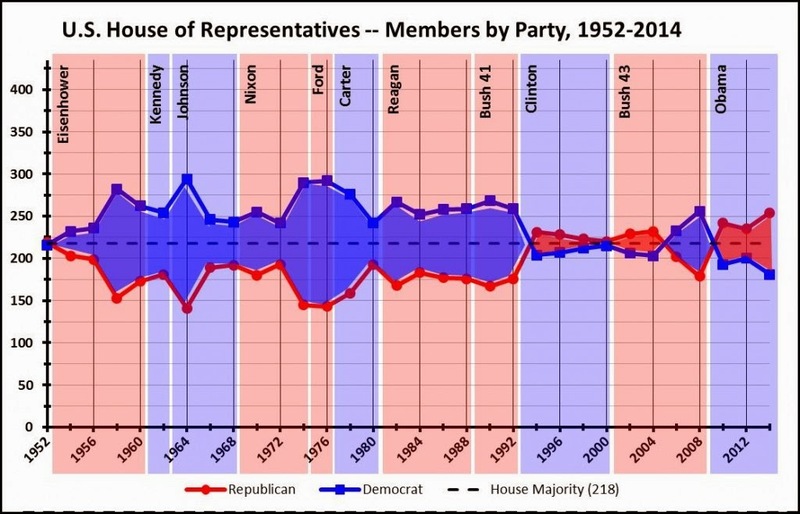 In 2010 the Republicans retook majority control of the House. 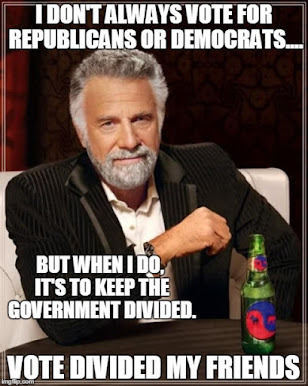 In 2012 Americans resoundingly reelected divided government. In 2014, Republicans took majority control of the Senate with a net gain of nine seats and padded their majority in the House with an additional thirteen seats. They now have the most seats in Congress and their biggest majority in the House of Representatives since the Hoover administration in 1928. But numbers alone don't tell the story. 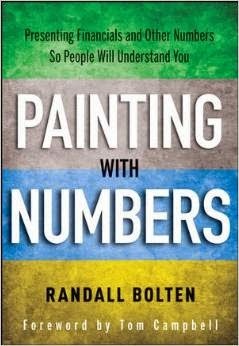 Randall Bolten literally wrote the book on visualizing data, saying about his work: “Painting with Numbers is my effort to get people to focus on making numbers understandable." I think we all could use some help making these recent election cycles understandable. 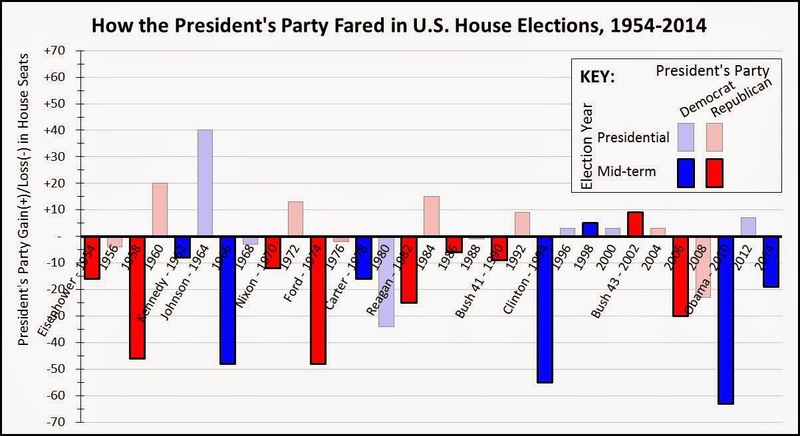 In a six-part series on his blog, Bolten shows us exactly what he means with a series of visualizations that help us get a deeper appreciation of the shifting partisan political fortunes in Washington D.C.
His second post on the topic featured a more granular version of the same graphic, explicitly including the results of midterm election. That graph is featured at the top of this post. We're seeing a trend that supasses the normal midterm meltdowns, and should be troubling to Democrats. 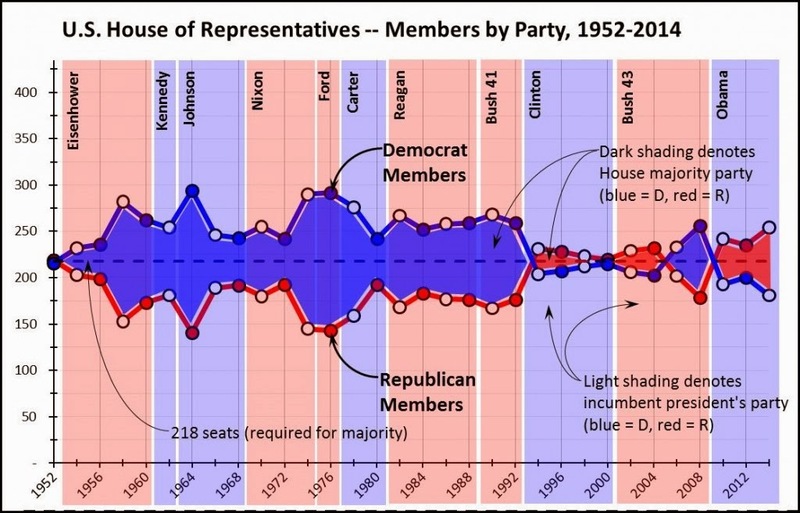 Given the Dividist's obsession with the dynamics of divided government in the modern era, the Reader can appreciate my fascination with Bolten's creative data visualizations and the insights they offer to the partisans shifts we've seen experienced. At the risk of pushing the limits of "fair use" I am going to rip Bolten's visualisations from his three subsequent posts on the subject and hope he will find my repeated fawning links to his blog and book to be satisfactory compensation. In the 4th, 5th and 6th posts, Bolten uses tables to reveal more details of the election results. Which, if any, of these "fickleness" insights can we apply to 2016? Democrats have yet to reconcile themselves to the strength of the Republican position in Congress. 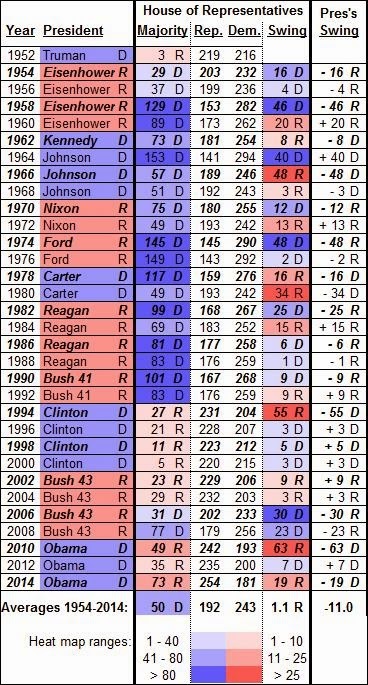 We are at the high water mark of a continuing long term trend supporting Republican gains in the House of Representatives. This fact, combined with the historic incumbency advantage in the House, means that the Republicans are a virtual lock to keep the House majority in 2016 and probably 2018. So Nancy Pelosi's 2016 prediction will be just as wrong as her 2014, 2012 and 2010 prognostications. Hillary is not running against the headwind Bolten identifies of a single party winning the White House with three consecutive presidents but she is swimming against a GOP tide. OTOH, she very well may benefit from the fickleness of the electorate and their apparent distrust of single party rule. With no chance of the GOP losing the House and plausibly keeping the Senate, a fickle and dubious electorate will need a Democrat in the White House to offset a Republican controlled Congress and keep the government divided. 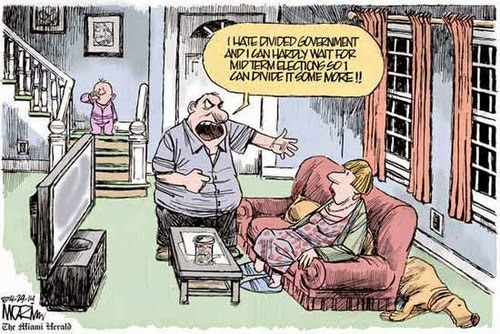 And that suits the Dividist just fine.